All About Pasta & Noodles upholds that standard. While keeping the conversational and instructional manner of the flagship book, All About Pasta & Noodles is organized into chapters that include fresh pasta, sauces, filled and baked pastas, American noodle dishes, Asian noodles, dumplings, and more. The chapters incorporate more than 90 of Joy's best-loved recipes -- Spaghetti alla Carbonara to Spicy Szechuan Noodles to Bolognese Sauce. You'll also find rules for cooking pasta, step-by-step information for making homemade pasta, and suggestions for pasta shapes and sauces. Add to that more than 150 original photographs, specially commissioned for this volume, presented in the most easy-to-use design imaginable. 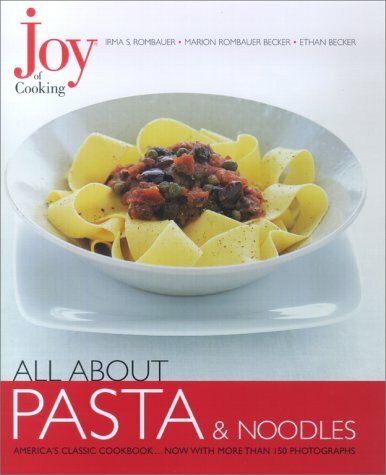 Whether you belong to one of the millions of American households that already own a copy (or two) of Joy, or you have never cracked the spine of a cookbook before, Joy of Cooking: All About Pasta & Noodles is for you. It is a spectacular achievement, worthy of its name. Joy has never been more beautiful. About: Includes recipes for fresh pasta, sauces, filled and baked pastas, American noodle dishes, Asian noodles, and dumplings.